The DTEA1250 series of AC/DC desktop power supplies provides up to 250 Watts of continuous output power. All models have a single output and a wide input voltage range of 100~240VAC. This series is Energy Star Level VI, CEC and RoHS compliant and has over voltage, over current, and short circuit protection. This series also has four AC inlet connector types available: IEC-320 C14, C8, C6, and C18. Optional output connectors are also available please call factory for ordering details. 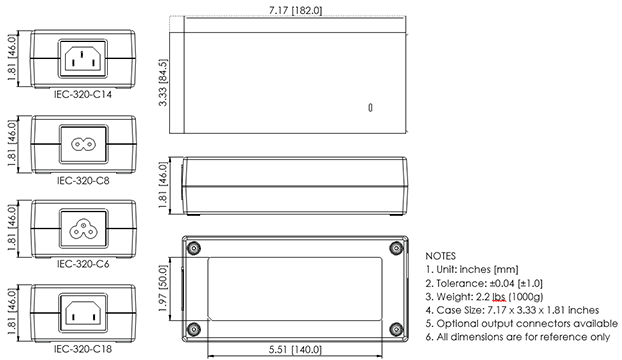 Dimensions: 7.17" x 3.33" x 1.81"
Notes: (1) The “x” in the model number represents the type of AC inlet connector: “x” can be “1” for IEC‐320‐C14 type, “2” for IEC‐320‐C8 type, “3” for IEC‐320‐C6, or “6” for IEC‐320‐C18 type. (2) The output voltage is specified as a range (Ex: 44~56 VDC); the customer must specify what they want the voltage set at. (3) Ripple and Noise is measured at nominal line and full load with 20MHz bandwidth and a 0.1µF ceramic capacitor and 47µF aluminum capacitors in parallel across the output. (4) Optional output connectors are available. Please call factory for ordering details. Due to advances in technology, specifications are subject to change without notice.